ARIZONA'S SHADOWS of the KING Freddy G! 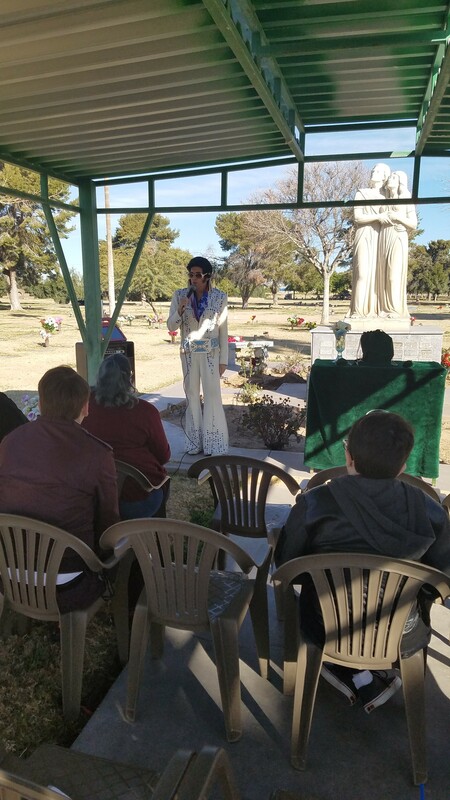 ELVIS TRIBUTE ARTIST HAS DONE OVER 2100 shows IN THE VALLEY! And 100% FEEDBACK! 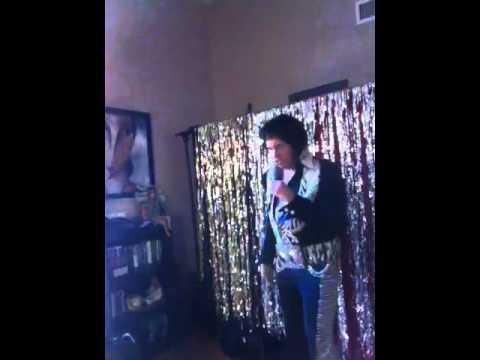 Freddy does an amazing rendition of his Elvis Tribute show. He works with tracks, Freddy is willing to customize his show to fit your needs. 16 jumpsuits to choose from. Freddy G will come into audience to make them feel part of the show! Freddy has performed, over 2100 shows in 14 years. He's an accomplished performer and knows how to move and sing like the king...... Freddy is a blast to have at your party events! And If your looking for a varity show with a tribute to Johnny Cash, Waylon, Willie,Jones. buddy Holly, Neil Diamond and Elvis All in costume. 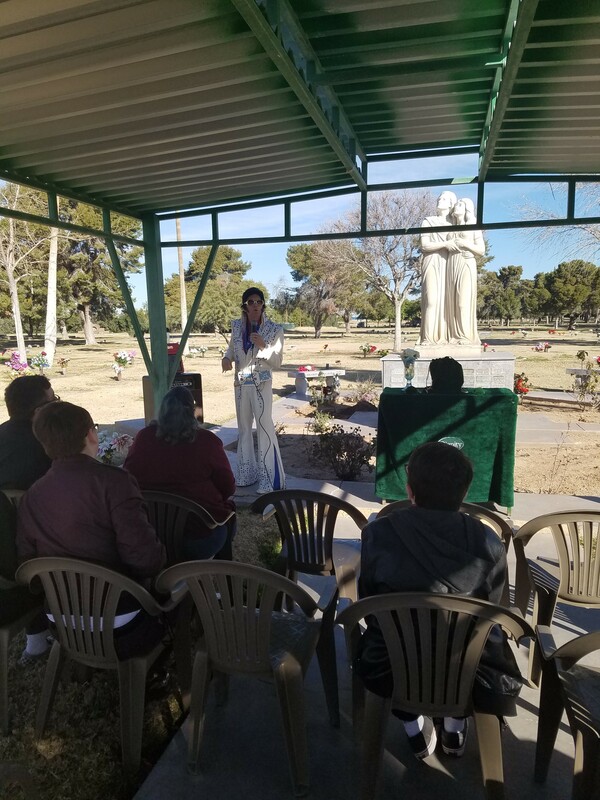 My mom died on January 3rd. She was a Huge Elvis fan. 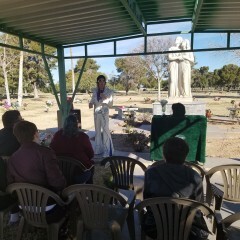 Freddy was amazing at helping me pick songs for her funeral. 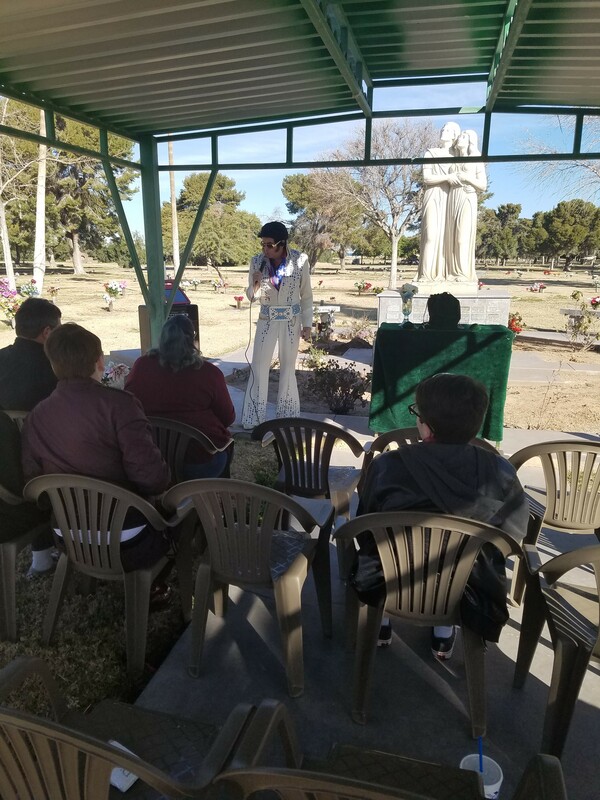 He came to the funeral dressed in the most beautiful Elvis costume. He looked amazing. His voice was Amazing. He was funny, sweet and kind!! I Highly recommend him!!! Freddy made our birthday gathering a birthday Party! His performance had us all up and dancing, from ages 70 to 7 months. In his performance, you can really see his huge respect for The King. A highlight of the night was Freddy’s Elvis doing “Sweet Caroline” with Freddy’s Neil Diamond taking a verse too. I would highly recommend Freddy for your next event. Thanks for the memories! Chris and friends I am humbled by your review, with over 2300 shows in my career as a singer, their are shows that I have performed that I will truly remember, your party will be one That I’ll always cherish! Sent Freddy G to my Aunts 92 birthday party I live out of state but I was contacted several times and Freddy made it all happen. My aunt and her friends all enjoyed his singing very much. Thank you so much! Freddy is AWESOME! Freddy performed for my father-in-law at the hospital. It was way better than sending flowers! I couldn't be there, so he was kind enough to send me photos. Thanks again! It was my pleasure to bring Elvis and Marilyn to your dads hospital room. Freddy was the guest entertainer for our annual Red Hat Society chapter Anniversary banquet March 20, 2015 in Queen Creek, AZ. He was not only an amazing entertainer who captured the hearts of our ladies with his classy style, but because of his unique sincerity and thoughtful attention to his audience, throughout his performance, he made each of us feel special capturing us as enduring fans s well. Freddy's willingness to go that extra mile to entertain us was truly heartfelt. He just made our day, and we appreciated him so much. Freddy is the best out there, Contact him First! 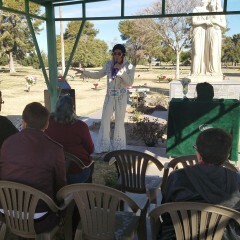 We had a funeral for our Uncle (a Die Hard Elvis Fan) and wanted to hire an Elvis performer to do a tribute for him. We contacted Freddy with very little notice and he was able to fit us in. His pricing was very reasonable and he was so respectful. Obviously playing a funeral is very sensitive. Not only did he do a very respectful set that honored our uncle but he also related in way that was very warm and caring and brought a little bit of fun that helped cheer everyone up. 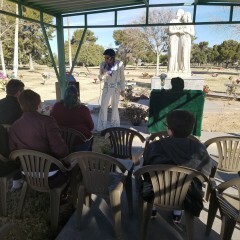 This was an amazing experience that our family will remember fondly forever. Thank you so much Freddy! Freddie + Elvis = WOW! 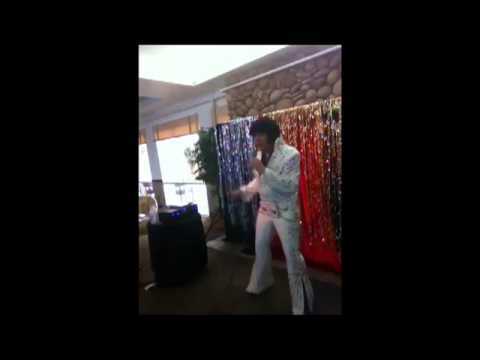 Freddie was a Perfect Elvis with great entertainment for my daughter's 30th birthday party. It was a treat to get more than your monies worth will all he does. You won't be disaponted, Freddie captures the persona of Elvis including his humor. Thank you Freddie for making a memory for my daughter that will last a life time. FREDDY G WAS THE BEST! Freddy G was the best! He was remarkably easy to work with and accommodating during planning, flexible and willing to please. On the day, he exceeded expectations. He has a wonderful singing voice; his "total look" created a fabulous tribute. Our party goers raved about him. He was friendly and very willing to sit for pictures with guests. I recommend him highly. This was my first booking of such an artist and frankly, I did not know what to expect -- I could not be more pleased with his performance. FABULOUS! Thanks tons, Freddy G! Freddy G Arizona's Shadow of the King was truly the best!!! Freddy G Arizona's Shadow of the King was truly the best!!! Everyone enjoyed his performance! I would definitely hire him again in the future. 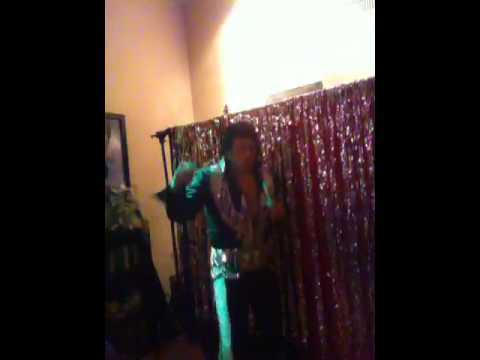 Anyone looking for a professional Elvis entertainer can look no further than Freddy G! This is the second time we have had him entertain us. We had Jack’s Birthday Party with 60 guests at a Catered Facility in Surprise Arizona on March 8, 2014. This is the second time we have had him entertain us. Everyone loved him, his voice and his body moves,and he had them up dancing in no time. The ladies love him. When he comes up close and looks deeply into their eyes, they are overcome! We rate him a 5 out of 5 star in the categories below. He made the party for us! We couldn't have been happier, everyone had a blast. I was so impressed that I was having a Vegas style show right in my living room....memories for a lifetime! Wonderful Elvis tribute artist, with excellent voice and fun and entertaining show! Thanks Freddy G!! You made my sister's 50th birthday party extra special! I will definitely recommend you to others for an awesome Elvis experience! and everyone was enthusiastically impressed. Look forward to seeing him again..
Freddy G rocked my retirement from the Air Force! Yes, that pun was intended...you rock! A stellar performance by Freddy G. All song requests fulfilled and two costume changes...yes, Elvis lives! Freddy G you rock! 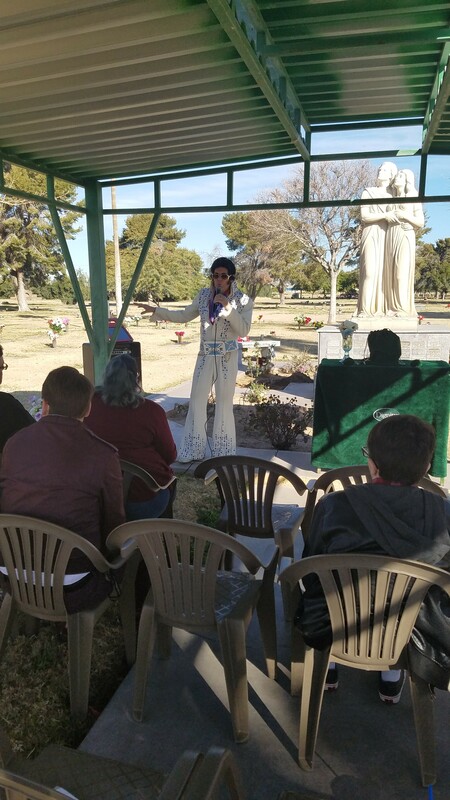 I booked him for my wife's surprise birthday party where the theme was "Las Vegas" and Freddy was the ultimate professional/performer. He is extremely talented, sounds just like Elvis and was great with the crowd! He made sure everyone got a picture with him and was very gracious. Our event was a reunion of old neighbors and friends, some of which hadn't seen each other for 30+ years and Freddy G was especially considerate of the fact that our guests ages ranged from children to seniors. 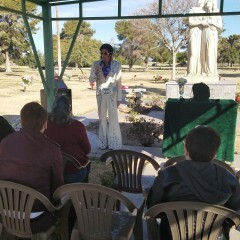 We received many compliments on his Elvis persona and performances. On several occasions, I noticed guests that literally stopped in their tracks on their way to or from the bar to take in his performance. He was very accomodating to alternate his performances with DJ services as we had requested, and he was also careful to keep the volume at a level that was comfortable for all of us in our relatively small space. We had a very positive experience and we recommend Freddy G as a professional that will deliver high quality service. Freddy G did an excellent job. Everyone at the party was VERY impressed! Thanks for making our Vegas party great! Freddy-G far exceeded my expectations. He was highly professional and accommodating. Rates were very reasonable. A true talent with great sound, I would hire him again in a heartbeat. Strongly recommended performer! Freddy was the topper that made our party a success. This was a 50's party for a jog down memory lane. 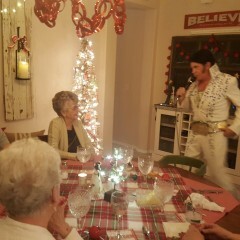 He not only sang his heart out but he had our guests dancing in the aisles. He is a wonderful performer who plays to his audience and develops a good rapport with them. He not only performed on stage but he mingled and interacted with our guests and was willing to adapt his act to our specific needs. Not only does he have all the moves and outfits of Elvis, but he sings the songs without lipsyncing with a voice as close to Elvis as you can get. We highly recommend him. My friends were all very impressed, not only by the singing, but by the show as a whole. He went above and way beyond what was expected, and everybody loved the performance. I would hire him again anytime, and will not reccomend anyone, except him to my friends and family. He interacted not only with the crowd, but also with some recovering soldiers without being asked. Freddy was amazing! He called me after I accepted his bid to make sure I had no additional questions and to let me know that closer to the date I would be able to choose what jumpsuit and what songs he would sing. 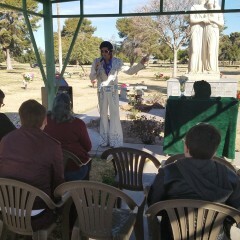 He was friendly and was incredibly verbal about his love for Elvis! He knows Elvis' history, the dance moves, and all the little quirks that made Elvis so memorable! The week of the party, we spoke several times to ensure everything matched what I wanted. He showed up on-time and was friendly and courteous, not only to me but to our guests as well. 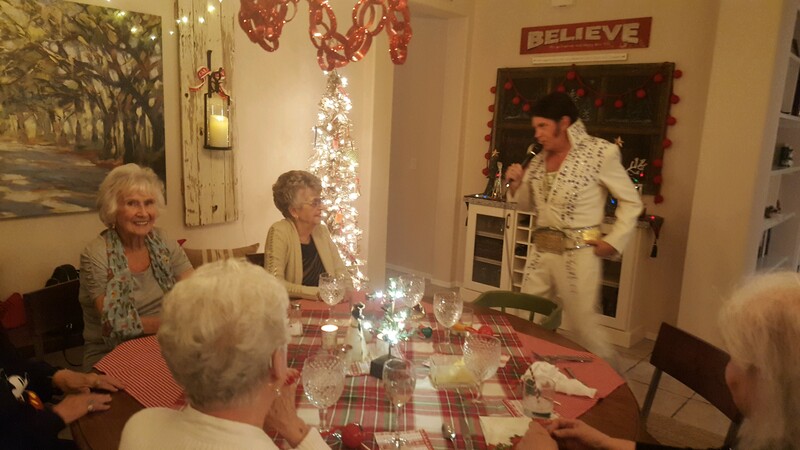 He sang Elvis' songs amazingly and created a wonderful Las-Vegas themed atmosphere that truly made our party that much more memorable! 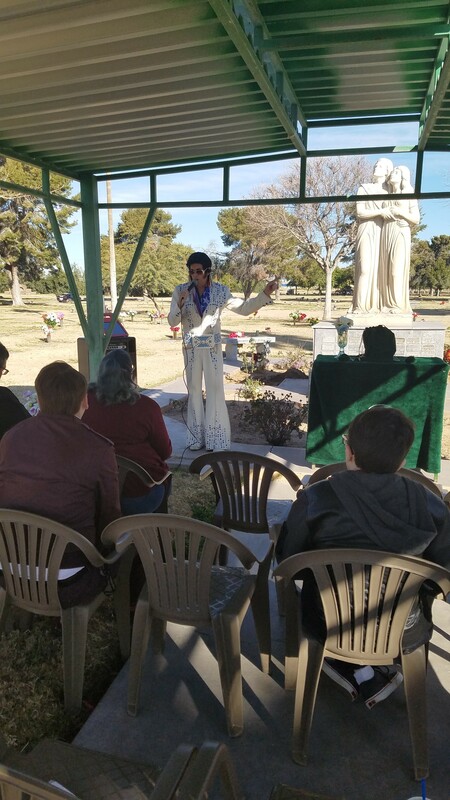 He stayed afterwards and talked and mingled with guests, took photos and said a lot of Elvis sayings that kept the party light-hearted and fun. Freddy was BEYOND impressive and we hope to work with him at another event! Thank you Freddy, you were awesome! Freddy was willing to split his time to do 2 seperate shows for our event. Between shows, he walked around in the crowd and interacted with people. Everyone had great things to say about him. He was definitely a crowd favorite among our many performers that weekend. He was very easy to work with, keeping in contact between being booked and the day of performance. I would highly recommend him to anyone needing a class act. What an awesome, gracious personable guy! Everyone at our gala loved him and he put on an excellent and energetic show, despite having travelled all day to perform at our event. We would happily have him back for another event in the future. He was GREAT! I keep getting calls from the guests saying how much they enjoyed the show. Super entertaining! He paid a lot of attention to the guest of honor, my father, and made him feel very special. I saw his show at a friend's party and immediately hired him to perform at my party. Loved every minute! 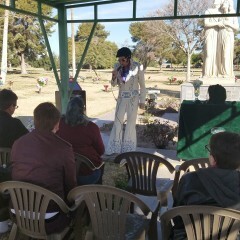 I just want to say how pleased my husband and I are in hiring Arizona's Voice of Elvis. Just getting back from our honeymoon, two weeks later, and people are still talking about his performance at our reception! What a crowd pleaser, he took requests, made the girls scream, my mother in law even fell in love all over again. If you're thinking about hiring Elvis, one thing is for sure, you won't be disappointed in making him your right decision. 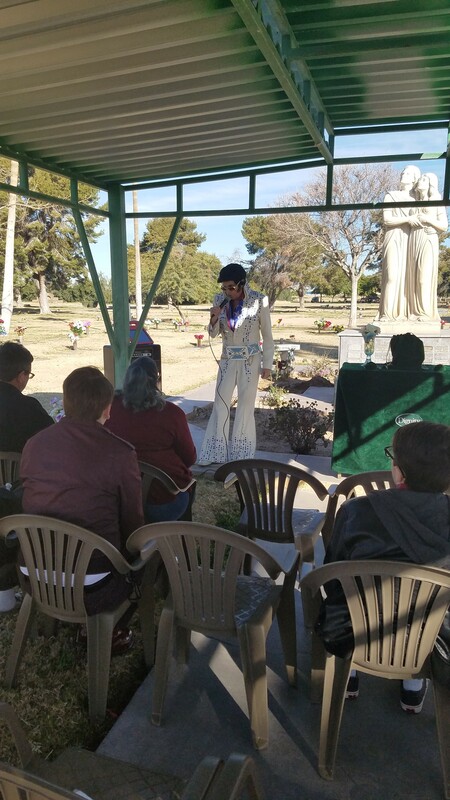 As the bride the last thing I needed to worry about was our entertainment and I am glad in looking back and watching our video that I went ahead and booked Arizona's Voice of Elvis ~ Thank you again so much!! Review by Wendy . L.
Freddy G was great! He was very accommodating and helped make our awards celebration a success! He went along with our requests and did a great job working the crowd and getting everyone involved! We would recommend Freddy G for your next function! Rock on Elvis and Freddy G! Review by Sandra D. R.
He was awesome! 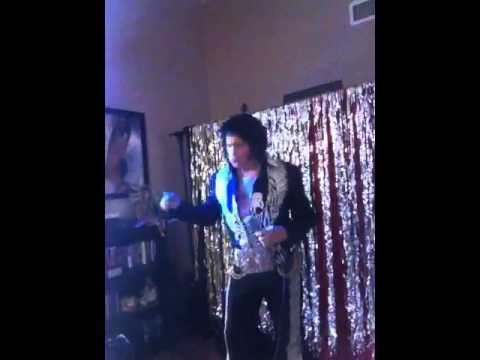 He went with the vibe of the party.He was professional and had a thorough knowledge of Elvis music and moves...Everyone at the party enjoyed his performance. After his performance he stayed for photos. 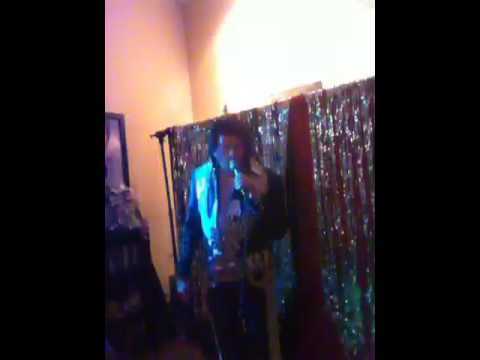 If your looking for an Elvis impersonator that has that Vegas feel...Freddy G is your Man. Review by T N. H. B.
I first became aware of Freddy when I saw his masterpiece Elvis artwork on his SUV. I called the number on the back and was thoroughly impressed when he came ON TIME, IN COSTUME, to audition and then BLEW ME AWAY with his EXACT impression of Elvis's voice. When he arrived for the New Year's Eve gig, he was early...in fact there before anyone else, did more than required, and was totally PROFESSIONAL...a genuine star. He is a TRUE singer...and totally interested in keeping his customer happy. Thank you Mr Freddy G Elvis...you rock! Freddy G has a great singing voice and put on a great show.I'm looking forward to his next show at the 5 and Diner in north Phoenix.His jumpsuits are fantastic.Totally enjoyed watching him perform. locally and has close to 1000 shows under his belt. my voice and I am always flattered when fan shows appreciation. full tribute show that will reflect the eras of Elvis. Tempe and many little towns in between. JUST FINISHED A TOUR IN BRITISH COUMBIA CANADA FORT ST. JOHN WITH JOHNNY CASH AND ELVIS SHOW! facilities when I can as well many other charities and organizations. Elvis Presley - I'll Hold You In My Heart Til I Can Hold You? Freddy was much, much better than I had even anticipated. He was punctual, his voice is amazing (sounds JUST like Elvis!) and went above and beyond all of our expectations. I got comments from everyone at the party about how great he was. He even stayed a little extra and sang us a surprise extra song! He handed out teddy bears and was very interactive. The audience just loved him. If you have ANY doubts about him, do away with them -- this guy is great. Freddy G was awesome! One thing that really impressed me was the fact that he drove to the location of the event prior to the performance date just so that he knew the area and would not get lost or be late. His professionalism was outstanding. He even stayed with us after he preformed to just hang out and take pictures. He is extremely accommodating and worked with me throughout the entire process to make sure that our party was a success.